Gartner, the world's leading IT research and advisory company, predicts that digital twins will be one of 2018s industry-shaping trends and that, by 2021, 50% of large-scale companies will use them. A ‘digital twin’ is a simulation, a digital replica of a process, product or service through information gathered by built-in sensors on equipment inside manufacturing centers. How does simulation work and why use it? How can simulation be applied to a supply chain or in my warehouse? Currently, Industry 4.0 includes sensors, wireless networks, machine learning, big data processing, virtual reality and digital twins to readjust manufacturing processes to changing consumer demands. Simulation is not a particularly new concept, although it is gaining greater importance due to continuous advances in the Internet of Things (IoT) and RFID device usage. The first entity to coin the term ‘digital twins’, to refer to simulations, and to put it into practice, was NASA after the Apollo 13 incident in 1970. The North American space agency latched onto the idea that it needed tech to simulate the reactions of its space vehicles before a ship’s crew was sent on an expedition. That said, it is possible to deploy simulation in any professional sector. Thanks to technological advances, companies can create and test equipment, products and processes in a virtual environment before putting these ideas into motion in the real world. Thus, potential problems or risky situations are detected, new layouts are tested and feedback received on solutions in all sorts of contexts. 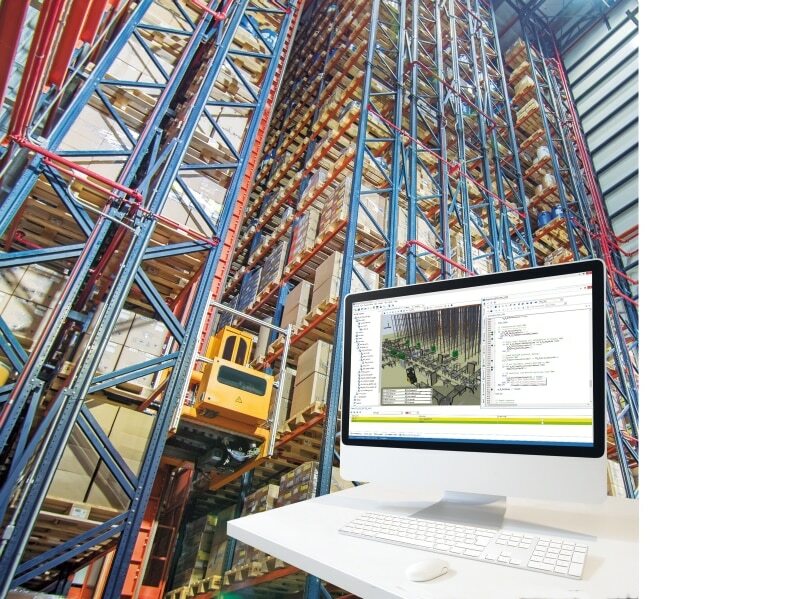 Ultimately, warehouse simulation is just one way to represent the experimentational process used to plan a warehouse, improving flexibility and increasing the productivity of a business. Continuous improvement of processes. Processes are viewed in a virtual environment so, further along, these can be used in a physical setting. A digital version of the processes is studied and continuously ameliorated and, through ongoing trials, results in breakthroughs in warehouse management. Overall, this experience bears fruit in the form of the project’s physical version. Cost savings. Designers and engineers can create and perfect a product in this virtual environment, instead of building tangible, cost-intensive prototypes. Prevent malfunctions. It is possible to detect problems before they arise, thus preventing service stoppages and downtimes to repair machinery or modify processes. According to a study by the World Economic Forum, done in conjunction with the consulting firm Accenture, maintenance costs can be lowered by 30% through predictive maintenance. Increased productivity. According to Siemens, warehouse simulation helps a business cut a product’s ‘time to market’ by 50% and raises productivity by 20%. Planning ahead. Data analysis and warehouse simulation enable predictive performance and bolster innovative development in all processes, keeping companies a step ahead of the competition. Oversee decision-making. All processes are interconnected and, as such, intertwined in real-time. Thus, decisions can be made based on updated, accurate data. Supply chain simulation is a virtual representation of all logistics processes a product goes through, from manufacture to the end customer. Automation of logistics processes and the advance of new technology mean equipment, products and operators in a supply chain are interlinked, and big data is provided in real-time. Big Data, namely the process of managing huge amounts of data, transforms information in order to rework any process. It sets into motion faster response times in unforeseen circumstances and situations, potential incidents and occasional market fluctuations. A company needs global supply chain visibility to analyze this data and convert it into usable information. More and more firms see their supply chain as a strategic driver in their business. Simulation offers relevant information to help differentiate the pros and cons in all processes and, as such, control and improve them immediately. For example, one of the most significant challenges in doing business today is to deliver orders to customers in as short a time as possible. To this effect, a simulation gives a bird’s eye view of a supply chain, facilitating decisions made to reduce bottlenecks and inefficiencies that slow down in-warehouse operations. 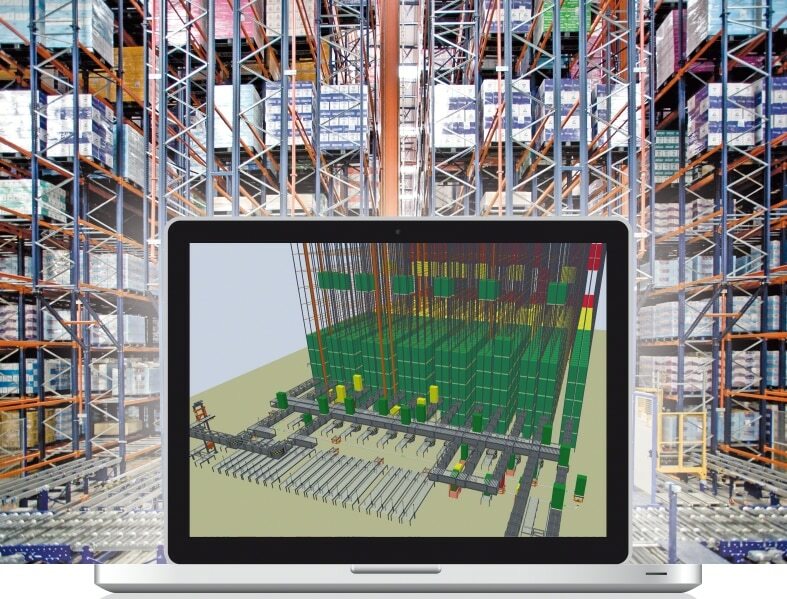 The simulation of a warehouse is a virtual representation of all the elements found within it and which participate in its operations (the goods, storage system, handling equipment, etc.). Display how a warehouse and the warehouse management system (WMS) will work. Thus, start-up times and errors are minimized. Corroborate the productivity of the solutions that comprise a warehouse and apply needed changes before its start-up. In essence, the mission of these tools is to give customers the ability to verify what their warehouse will be like before it is up and running, and to mold it to their requirements. Interlake Mecalux uses this tool to simulate how automated installations run. It is mainly deployed during the tender phase of an Easy WMS managed warehouse. It displays what a warehouse will look like, how it will run and how Easy WMS will operate. Furthermore, Easy M creates reports about estimated installation productivity (e.g. number of movements to be done, orders that can be prepped, etc.) so that managers can make risk-free strategic decisions for their business. Realistic estimations of warehouse cycles based on logic and logistics center operations. Anticipation of all exit orders. Comprehensive control of warehouse goods and automatic rotation calculations of all items to be housed in the warehouse. Use this tool, in tandem with Easy WMS, for 3D design, configuration, validation and simulation of a warehouse (either automatic or manual) in pre-startup planning. While Interlake Mecalux’s technical team takes charge of configuring the warehouse as per the customer’s specifications, the customer can get an idea of what the installation will be like thanks to the simulation and check that all components operate properly. Warehouse configuration is done jointly with the customer, to resolve specific storage requirements. Using small amounts of data and parameters, it designs a warehouse for a customer’s pre-existing facility or one it plans to build. Warehouse operations are validated before its commissioning takes place. The simulation of general in-warehouse operations means cycles, times and potential incidents are checked out beforehand. Easy S provides useful, reliable information to any support services. Customers can avail themselves of the remote teleservice at any time to answer questions, queries and incidents that may come up. 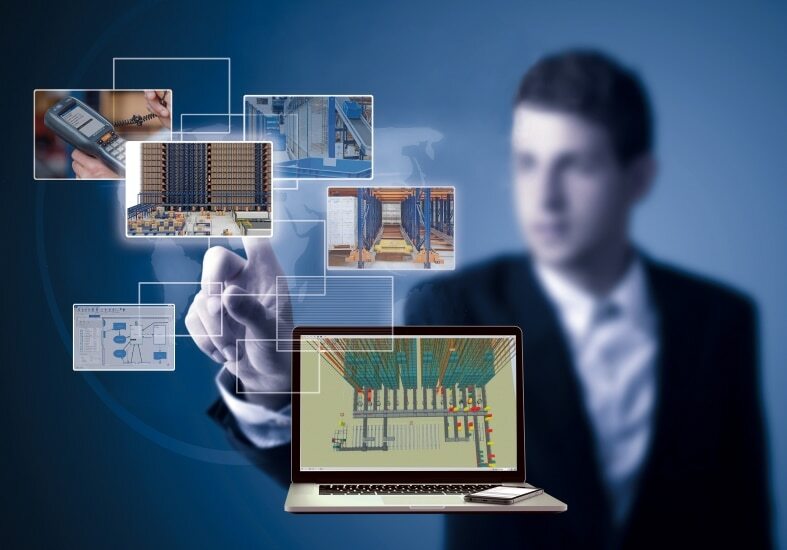 It is the next step in the evolution of the Galileo control software from Interlake Mecalux (tasked with ordering the movements of the various devices in an automated warehouse, for instance, conveyors, stacker cranes, transfer cars, etc.). Our AWS can simulate electromechanical equipment operations of a warehouse through a Supervisory Control And Data Acquisition (SCADA) system. 3D project viewing. The image is highly-realistic, with visually impacting accuracy. Zoom in or out of the image, rotate it, etc., as needed. In-warehouse electromechanical equipment commissioning times are significantly shortened. A test scenario is used through the AWS simulation to check the communication between the WMS and the Galileo control system. Afterwards, only tiny adjustments are needed onsite, such as to finetune timing issues contingent on the position of the sensors, to adjust the variable-frequency drives, etc. It comes with a standard code base. Our AWS can be used in any PLC and behaves in the same manner. Interlake Mecalux has dedicated years to developing software solutions specifically to maximize warehouse productivity and ensure top quality in all logistics processes. Simulations have enormous potential in supply chain management. Simulation tools such as Easy M, Easy S and the Automatic Warehouse Studio (AWS) play a vital part in the design and validation of warehouse operations, in addition to the plethora of tests performed to check that everything runs as smooth and efficiently as possible.